TableTop King Jr. Mammoth Pecan Halves, Raw - 30 lb. Known as Jr. Mammoth for their premium medium to large size, these raw pecan halves from TableTop King are great for baking applications or for serving on their own! 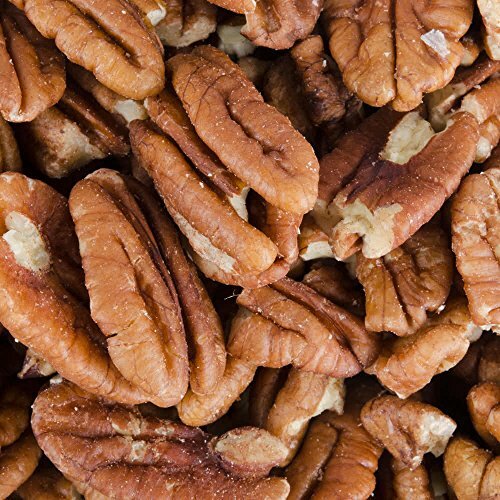 Grown in the fertile Southwest region of the United States, these nuts are part of the 75 year old TableTop King tradition of growing and shelling top quality pecans. They add a crunchy, slightly buttery texture and nutty taste to a variety of dishes, including roasted vegetables, salads, or a scoop of ice cream. More than a garnish or topping, they can also be used for classic pecan pies or pecan cobblers. Since they're raw and contain no salt, they're perfect for baking and they won't lend any additional salty flavor. Blend these pecan halves into your favorite recipes or mix them with other nuts and serve as hors d'oeuvres at your party or event. Great for your patrons' health, pecans contain good fats that help lower cholesterol and improve cardiovascular health. They also contain a handful of healthy vitamins and minerals, including, but not limited to, vitamin E, vitamin A, and zinc. Heart healthy, these pecan halves will boost the nutritional value of your dishes while adding a nutty, nourishing taste. They add a crunchy, slightly buttery texture and nutty taste to a variety of dishes, including roasted vegetables, salads, or a scoop of ice cream.